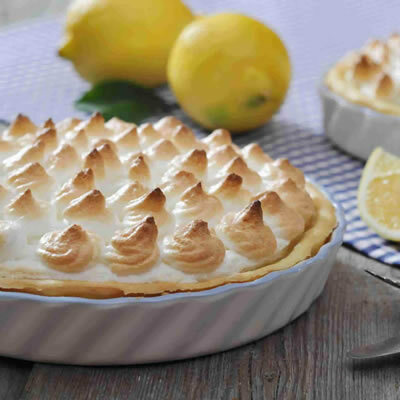 Meringue is a popular topping for lemon pies. Meringue is a popular dessert made from egg whites, sugar, and cream of tartar or another form of acid. When baked slowly, this dessert is sometimes referred to as “pets” or “forgotten cookies” due to the fact that they can stay in the oven for an hour and a half or more. Meringue made with powdered sugar and cornstarch is called a Pavlova, and is the national dessert of Australia and New Zealand. Meringue is used in a variety of ways. It is frequently made into cookies and eaten plain, or used as a topping on cakes or pies. However, meringue can also serve as the base of mousse, angel food cake, baked Alaska, and royal icing. The first recipes for meringue were called white biscuit bread, and appeared in cookbooks in 1604. It is rumored to have been invented in or near the town of Meiringen Switzerland, but this fact is disputed. The word meringue first appeared in a French cook book in 1692, and then moved to Italy where the recipes continued to change and adapt. Meringue today is remarkably similar to meringue during the 1700’s. Meringue is a dessert and should be eaten in moderation due to the high amount of sugar. However, it is a fat free food, and often considered healthier than other desserts. It is a popular treat for those who are trying to keep a diet. Since it does not have any flour, it is a relatively low carbohydrate food. There are many variations on meringue. The most common additions are vanilla, coconut, and almond extract, however fruits are also sometimes added to give unique flavors. French meringue is the most common form of meringue made at home and is simply egg whites, sugar, and cream of tartar mixed together. Italian meringue is stiffer and more stable than French meringue and is made by whipping hot simple syrup into egg whites. This cooks the egg whites as it is made, allowing this type of meringue to be eaten without baking. The last type is Swiss meringue, which is a dense glossy form of meringue. This is made by mixing the egg whites while they are in a double boiler. This type of meringue is also safe to eat without additional cooking. Making meringue is fairly simple, but there are a few things to keep in mind. When making a meringue, there should be no addition of fat in any form. This includes oil based extracts. Oil interferes with the denaturation of ovalbumin, the protein in egg whites, which results in meringue incapable of forming stiff peaks. To make meringue, simply start beating egg whites while slowly adding in sugar, and a small amount of cream of tartar. Using an electric beater is the easiest way to do this, but with patience and arm strength, chefs also make meringue by hand. Meringue made at home is frequently crunchy on the outside and chewy on the inside, like a toasted marshmallow. If using a copper bowl, the addition of cream of tartar is not necessary to form stiff peaks because of the interaction of eggs whites and copper. Once it is made, meringue will quickly deflate and become soggy, so it is recommended to use this dessert quickly.